Government will soon stop receiving payments in cash as the country’s digital payment options continue to gain more grounds, Vice-President Dr. Mahamudu Bawumia has said. “We are getting to a point where very soon government will have to stop accepting cash payment anywhere. Once we do that, one of the biggest enemies of corruption is technology. 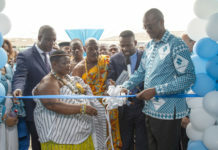 “If we can track all payment and collect them properly, it will make it more difficult for people to steal the money if it is all electronic,” he said at the official launch of PaySwitch Company Limited, a Ghanaian company providing alternative banking and payment solutions. Dr. Bawumia noted that once the infrastructure needed to support a full cashless economy is put in place and stabilised, government has to take full advantage of it and be able to receive payments for all sorts of services electronically. Government, according to Dr. Bawumia, is aggressively pushing digitisation and formalisation of the economy agenda through launching a series of initiatives. Some of them include the digital address system, mobile money interoperability, paperless port, soon-to-be-rolled out national ID system, smart driver licences, e-business registration and certification, and digitisation of land records. Dr. Bawumia is very optimistic that a cash-lite leading to cashless economy will take place soon. “It can easily be mandated and I think this is where we should be going,” he told the audience made up of bankers, fintechs, policymakers, telecom players and other stakeholders. The Vice-President noted that while government is working hard at formalising the economy and ensuring financial inclusion, the bigger challenge it faces now is how to ensure the economy creates a system that allows for integration of payment resources. “As the economy evolves so does the lifestyle of its citizens, and such evolution must be matched by competent skill and industrial knowledge backed by the necessary technological infrastructure. A properly harnessed effort in this area has the capacity to transform society significantly toward achievement of a cashless economy,” he pointed out. Governor of the central bank, Dr. Ernest Addison, noted that the Bank of Ghana will continue to play a facilitating role to help develop the needed infrastructure while taking corrective actions to safeguard security of the financial market infrastructure and customer plans, and promote an enabling environment for product and services to be tried. He hoped that PaySwitch will take advantage of the platforms provided by the legal and regulatory framework for the payment system ecosystem. “The central bank more than welcomes a more competitive payments landscape that these new reforms will be to the system. Transitioning from a cash-based economy to a cashless economy, on the back of electronic payment, requires consumer confidence. “Stakeholders must therefore seek to provide consumers adequate information needed to confidently transact business, and this should be supported by consumer education, transparency and timely responses to consumer concerns as well as enhanced durability, security and availability,” he urged. Kojo Choi, Managing Director of PaySwitch, in his remarks hoped that PaySwitch will become the payment platform that creates a backbone of trust in Ghanaian society. “A trusted cashless society where payment to companies and institutions such as DVLA, ECG, payment of Police fines and other must be made transparently,” he said. He noted that with transparency in digital payment platforms, people will trust the public servants and also government – which will drastically reduce corruption. “It will not only widen and deepen our tax net, but also promote Foreign Direct Investments (FDIs) and will also call for the return of our precious Ghanaian human resources; and these human capital, as they return, will once again propel our society to the next level,” he noted..
A new report on Ghana by the United Nations-based Better Than Cash Alliance, released last year, has shown that despite the massive improvements recorded in digital payments among individuals, businesses and government, cash still remains the predominant mode of payment in terms of value and volume. The report, which was published in September 2017, noted that 37 percent of the GH¢571billion payments made in 2016 were done digitally; however, the 98.72 percent of the 6.8 billion payments by volume are still being made in cash. The report alluded to the progress made in digitising payment to good Internet connectivity, levels of financial inclusion in Ghana above the regional average, expansive mobile money agent networks, solid payments infrastructure, and continuously improving regulation spearheaded by the Bank of Ghana (BoG).